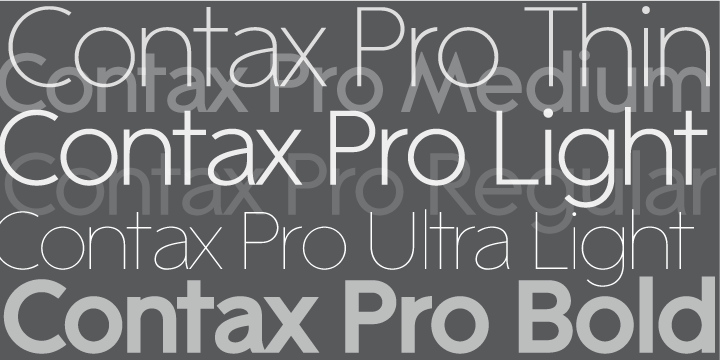 Contax Pro was created by Alex Kaczun, an American type designer. 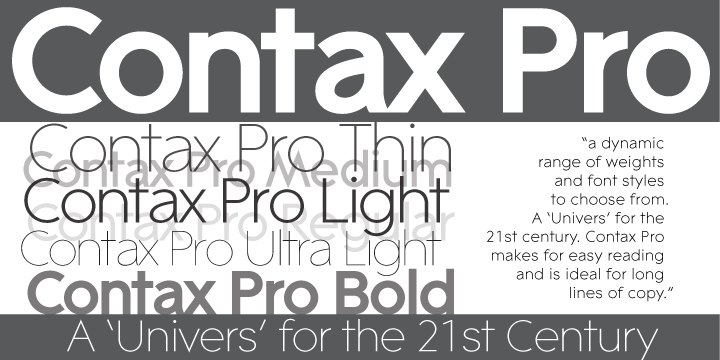 Contax Pro is a contemporary design based on generous proportions and clean, crisp lines. Forget about 'Helvetica'. Look out 'Univers'. Contax Pro is the new geometric sans typeface series for the 21st century. Contax Pro makes for easy reading and is ideal for long lines of copy. Contax Pro includes true drawn small capitals and old style figures. The family comes in 6 weights: ultra light, thin, light, regular, medium and bold. Alex has also created true italics to compliment the roman weights, as well as, all the Central European market character sets. In addition, Alex Kaczun has plans to expand the character sets to include Cyrillic and Greek. The fonts will also incorporate alternate glyphs to further expand the functionality and appeal of this dynamic new font series.